Flavors of The Caribbean – It’s An Island Beach Party! 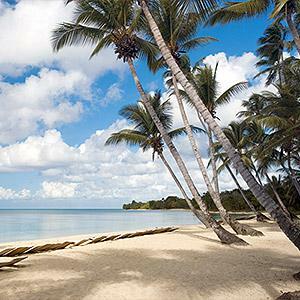 Imagine you are planted on a colorful wooden chair next to a golden beach shaded by palm trees and crystalline waters teeming with colorful tropical fish. Smell the spicy food cooking in the shacks behind you, groove to the calypso music, and bask in the gentle leisurely lifestyle of the islands. Sounds like something dreams are made of, huh? Well, tonight we’re going down to the islands, Mon, and we’re adding a spicy food competition to our island fete. You’ll start the evening with the ever-popular tropical Rum Punch and then divide into teams. We’ll supply a mystery box filled with an array of salsa and guacamole ingredients. Then you’ll work together, using a molcajete to create your own signature salsa creations. Fun! Next, you’ll dive into more hands-on cooking action alongside your experience instructor, Susy Lara, as you learn to prepare fantastic Caribbean-Mex-inspired dishes like Grilled Queso Fresco with Roasted Poblanos, Pollo Asada - a tasty marinated and grilled chicken dish, Grilled Pineapple (yes, it’s a thing! ), and Cilantro Lime Rice. We’ll end our beach party fiesta with a creamy yet ‘cake-y’ Choco Flan. Wow! Feel free to wear your favorite island-themed shirt…and sombrero! Yeah, Mon! Sat 7/6/19 6:30 - 9:00 p.m.